The Otago Golf Club can add the Otago champion of champions title to the senior A metropolitan pennant series after winning the event over 18 holes in wet and chilly conditions at Chisholm Links yesterday. The Balmacewen trio of Duncan Croudis, Kyle Clark and Alastair Adam finished with 70 gross stableford points to beat Taieri Lakes by a single point in a tight tussle. Arrowtown and Island Park finished in a tie for third on 68 while the Chisholm Links team was one further point back on 67. 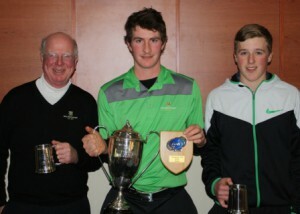 Duncan Croudis led the way for the Otago Club team, scoring a low 74 in the difficult conditions. He birdied the third hole but turned square with the card after making a bogey 5 on the sixth hole. Croudis made a double bogey six on the testing 12th hole and dropped a further shot on the par 3 14th to finish 3 over par. This gave Croudis 33 points while intermediate champion Kyle Clark chimed in with 20 points and Alastair Adam came in with 17 points. Taieri’s senior champion Mark Andrews carded 30 points while Michael Minty (Island Park) and Sean Geary (Chisholm Links) joined Lower Waitaki junior Johnny McKay with 28 points each.